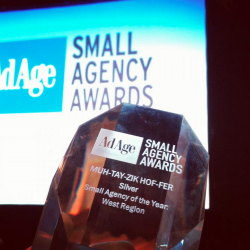 MUH-TAY-ZIK | HOF-FER wins at the AdAge Small Agency Awards. Matt and John made the trek up to Minneapolis last week for the AdAge conference. John made the cab drive by his old house in the Lowry Hill neighborhood to show it to Matt. John lived there with his family for a year and a half when he was running the Citi work at Fallon. Even drove by the kids’ old school. Very sentimental. Anyway, the next day, the agency was treated to some good advice from a variety of contributors. We enjoyed cavorted with old and new friends from the likes of Baldwin&, la communidad, and Mekanism. Then in the evening we were presented with a nice little hunk of acrylic. This of course was followed by a fine late-night festival of carousing about Minneapolis at the likes of Matt’s for some Juicy Lucy (burger with the cheese on the inside of the patty) and then famous Nye’s.